Unfortunately, over the weekend there was an issue with the rover’sarm while the "Greenhorn" sample was being dumped, which caused the rover tostop what it was doing. On Sol 1196 Curiosity drove an additional 33 m closer to the lee side of "Namib Dune." On Sol 1194 Curiosity drove 47 m around the lee side of "Namib Dune." Over the weekend Curiosity drove 42 m closer to "Namib Dune, and the view is pretty spectacular. We received the data needed to plan contact science and a drive, and the 3-sol weekend plan is another full one. Because of a problem with one of the DSN station antennas, the data needed to plan a drive today were not received, so the Sol 1189-90 plan is dominated by remote sensing observations. After successfully completing a mobility test last week (as seen by our wheel tracks through this sand patch ), Curiosity drove ~35 m toward a dune that is now named "Namib." The rover has arrived at the edge of "High Dune" and we havea very busy weekend plan studying the dune and then continuing to drive. Today we are planning the last sol of the mobility test,turning and backing out of the sand while taking multiple Hazcam images, thenpausing to take Navcam and Mastcam images of the wheel tracks. Today’s plan is focused on studying the results ofyesterday’s mobility test where we drove a little ways into a sand patch andthen backed out, leaving trenches where the wheels were. Due to problems at the Goldstone DSN complex, the bundle ofcommand sequences generated for Sol 1180 could not be sent to MSL. The MAHLI wheel imaging planned for Sol 1179 completed nominally, and the initial assessment showed no broken grousers. As many Americans are making plans for Thanksgiving, we’re making sure that Curiosity has plenty to do over the holiday weekend. Over the weekend, Curiosity drove 51 m closer to the Bagnold Dunes. This week Curiosity has been driving towards the Bagnold Dunes and characterizing the bedrock and sand along the way. The Bagnold Dunes are tantalizingly close, and this week is mostly focused on driving to the dunes. Unfortunately, our plans for the weekend were thwarted by aproblem with the Deep Space Network that prevented the plans from being sent tothe rover. The rover drove over 38 meters on Sol 1162, as expected. Today is a holiday for some of us, but not the MSL tactical operations team! The 55-meter drive planned for Sol 1160 completed as planned, and another 41-meter drive is planned for Sol 1162. Whew! It’s going to be a busy weekend on Mars! The Sol 1157plan starts off with an activity to test out AEGIS, a software tool that willhelp with choosing targets for ChemCam and Mastcam. Today’s planning was a bit challenging because we only got afew Navcam images down to show us possible science targets, which limited ourchoices for ChemCam observations. The short drive over the weekend went well, putting us in a good position for a longer drive in today’s plan. Ap ologies for the lack of an update on Wednesday this week! Lauren and I were both in a training class, and Ken was traveling so none of us were able to post here. The weekend drive was successful, placing us nicely on an overlook of the "Meeteetse" area. After a successful investigation focused on alteration zones around fractures, it’s time to move on. The Sol 1141 activities completed as expected, and the rover's batteriesare charged up enough to allow both daytime and nighttime activities intoday's plan. There was a problem processing the latest data from MSL at the DeepSpace Network station that received it, but the data are now availableand confirm that the Sol 1140 activities completed successfully. The ChemCam RMI images of the drill hole planned yesterday were successfully acquired and received, and were used today to plan 2 parallel LIBS rasters down the hole. Over the weekend Curiosity drilled another hole on Mars at the "Greenhorn" target. Unfortunately the Sol 1135 bundles were not uplinked due to a DSN issue, so the activities that we planned yesterday never made it onboard. The Sol 1134 mini-start hole on "Pilgrim" went well, as seen in the above MAHLI image . Sol 1134: Mini-start hole at "Pilgrim"
Curiosity is currently investigating an alteration zone around a fracture, and the plan today is focused on what we call a "mini-start hole." Sol 1133 activities are dominated by dumping the "Big Sky" sample and "thwacking" CHIMRA (the Collection and Handling for in-Situ Martian Rock Analysis) to clean out any remnants of the sample. Columbus Day is a federal holiday, but I'm scheduled as SOWG Chairtomorrow so I'm following Sol 1132 tactical planning and discussions ofour goals for Sol 1133. Curiosity is currently investigating an alteration zone around a fracture. I got up before dawn again today, and was treated to a beautiful view of the crescent Moon, Venus, Mars, and Jupiter in the eastern sky. MSL did well last weekend, but the Sol 1124 MAHLI images of the unsieved part of the drill sample showed that the APXS was not perfectly centered on the dump pile. The weekend plan includes lots of arm activities and science. Success! Our drill at "Big Sky" went perfectly! On Sol 1121,the rover will transfer some of the powder from Big Sky to CheMin so that itcan begin analyzing the mineralogy of the sample. Sol 1119-1120: "Go" for full drill at Big Sky! The plan for the weekend is to do a detailed analysis of the outcrop in front of us and then drive away and do some untargeted observations. Over the weekend,Curiosity had a successful ~ 21 m drive, and we’re currently parked in front of a beautiful outcrop of the Murray formation (shown in the bottom half of the above Navcam image, overlain by Stimson). The Sol 1101 activities that we planned yesterday did not complete due to an arm error while it was being stowed. The 34-meter driveplanned for Sol 1100 placed the rover at the edge of the small plateau,as intended, with a good view of a bright Murray Formation outcrop . MSL did well over thelong weekend, except that the Sol 1098 drive was halted after 13 metersof the planned 25 meters because the rover could not confirm that thepath ahead was safe. The drive on Sol 1093 went well, and Curiosity drove ~15 m towards Bridger Basin. After successfulcontact science on the Stimson unit in the Williams area, it’s time to get back on the road. Curiosity is currently investigating an outcrop of the Stimson unit. Planning is no longer restricted, but we had to start at 6:00 PDT this morning to give the operations team enough time to uplink commands by the time the rover expects them. 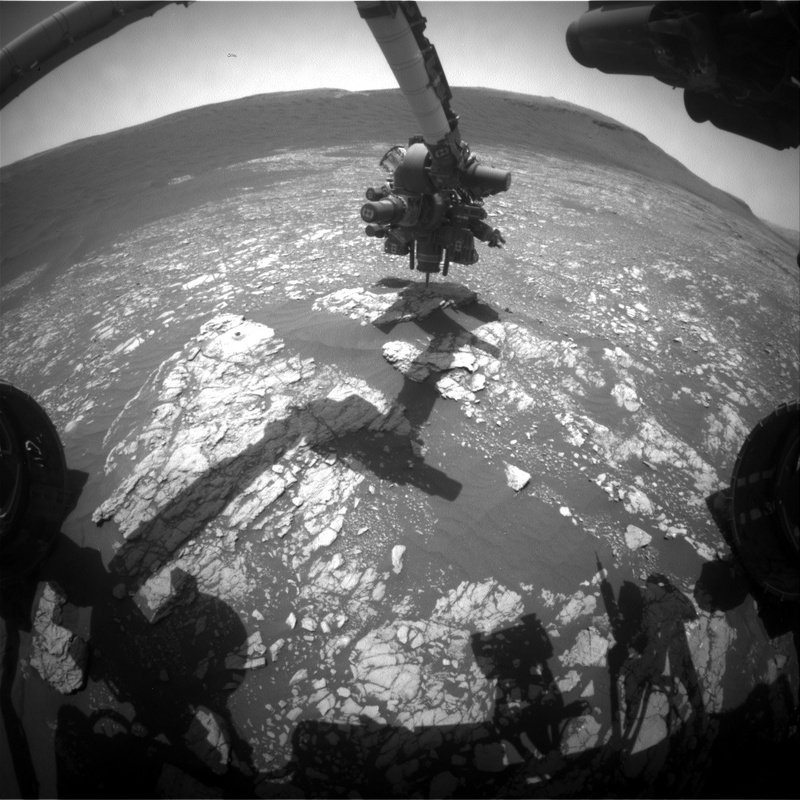 Curiosity is currently making her way through some beautiful exposures of the Stimson unit. The complex, nearly39-meter Sol 1085 drive completed successfully, leaving the rover inanother target-rich area. MSL had a good weekend, and returned lots of data including nice MAHLI images of Ravalli . I'm having anothervery busy day as SOWG Chair, as we are planning lots of activities tokeep the rover busy this weekend. We had another successful drive on 1079, going about 29meters this time. I had an easy planning day as MAHLI/MARDI uplinklead today, because another drive is planned for Sol 1078 with only theusual post-drive MAHLI (stowed) and MARDI (twilight) imaging. Sols 1075-1077: Time for SAM! The 47 meter drive on sol 1073 went exactly as expected,putting us in a good position for the sol 1074 plan. The drive on sol 1072 was successful, with a total distancetravelled of about 35 meters. Unfortunately over the weekend there was an outage at theDeep Space Network, which prevented the plan for the weekend from being sent toCuriosity. Curiosity had a successful drive of 19 m on Sol 1067, and we are currently back at Missoula for more targeted science. Sol 1067: Bumping to Missoula… sound familiar? With a familiar blogtitle, I report that in today’s plan we’re bumping towards the Missoula outcrop. Sol 1066: Happy 3rd Anniversary on Mars! Tonight marks the third anniversary of Curiosity’s landing in Gale crater. It’s been a great couple of weeks at the Lion outcrop, but it’s time to move on. The activities planned for last weekend completed successfully, including sample dropoff to CheMin and analysis of the minerals present. This morning, the MSL operations team was very happy to see that drilling into Buckskin was successful! The weekend plan therefore has more arm activities, including transferring the sample to the scoop for inspection. Sol 1060: GO for drilling! It's another exciting day on Mars! Curiosity is investigating some high-silica targets at an outcrop named "Lion." Sol 1059: Drill Testing and Analyzing "Ch-paa-qn"
Today the main event is a "mini-start hole", which is thename for a new type of initial drilling test that we are trying out on thetarget "Buckskin". The "bump" over the weekend was successful, so we are rightwhere we want to be to attempt drilling at "Buckskin" in the "Lion" area. The main priority in today’s plan is to nudge the rover abit closer to the target "Buckskin", which is in the area where wehave discovered rocks high in silica and hydrogen. The Sol 1046 wheel imaging completed nominally, and the rover is a little over 1 meter from its previous location. The drive over the weekend stopped a bit early (~17 metersinstead of the intended ~25 meters) because the software that the rover uses tomonitor its drive progress was being extra cautious. The rover bumped back 33 cm on Sol 1039, placing all 6 wheels onfirm ground and allowing contact science on the bright rocks near thetop of the slope in front of the vehicle. I'm MAHLI/MARDI uplink lead today, and was readythis morning to plan lots of MAHLI imaging of the bright rocks on theslope the rover first climbed on Sol 991. Over the weekendholiday plan, Curiosity drove back to our location on Sol 992. Sol 1033-1036: Independence Day Planning! Phew! Today was a busy day on Mars! Ken and I were both onoperations today, picking up where Lauren left off yesterday. Today we planned some MAHLI imaging along the contact near the "Missoula" target (the ledge in the upper left portion of this Navcam image ). Curiosity is still investigating the contact between the Pahrump and Stimson units. Mars has passed through solar conjunction , and reliable communication with the spacecraft at Mars is possible again. Today is the last dayof MSL tactical operations until after solar conjunction, so this will probably be the last MSL update for a few weeks. We're planning 3 sols of MSL activities today, starting with Sol 1000! As we continue to prepare for solar conjunction, arm motion is allowed in this plan, but no contact science. Today is the last day we can plan MAHLI activities before the operational stand-down for solar conjunction, to ensure that we have time to confirm that MAHLI's dust cover is safely closed. A short bump on Sol997 put Curiosity in a great position to investigate a few different rock units in Marias Pass, using the instruments on the rover’s arm. Curiosity spent the weekend characterizing the terrain and bedrock exposed in Marias Pass. On Sol 992 Curiosity took a short drive into Marias Pass to get a better look at the terrain ahead. Curiosity conqueredthe hill on Sol 991, and we were rewarded with a beautiful view of Marias Pass. After assessing a few different drive paths to deal with the challenging terrain, the team decided to drive uphill to avoid crossing the ripples near Jocko Butte. Testing of the new ChemCam automatic focusing software continues to go well--the instrument is returning well-focused data of the quality we got used to early in the mission. The backwards drive on sol 986 was successful, and over theweekend, Curiosity drove back toward "Jocko Butte". We’ve been having trouble with the path we originally wantedto take through the sand toward the interesting geology at "Mt. Once again, excessivewheel slippage prevented MSL from driving as far as planned, so thetactical team decided to take a break from driving to allow variousoptions to be studied in more detail. The MSL tactical team took a day off yesterday to allow Earth and Marstime to synch up; planning is no longer restricted and we will beworking every day the rest of this week (including Saturday ). The Sol 981 drive got the rover around the troublesome ripples and to the desired location, which gave us a good view of the terrain ahead. The Sol 978 drive stopped after going only a couple metersinstead of the expected ~19 meters because Curiosity detected that its wheelswere slipping in the sand. The sol 976 drive was successful and we are close to "JockoChute" (our informal name for the saddle point west of Jocko Butte). With our weekend contact science done, it’s time to hit theroad again. This morning the MSL science team used all of theavailable data to decide whether to approach one of the nearby outcropsor drive away. Our drive on sol 967 covered almost 90 meters, putting us infront of some interesting stratigraphy at "Mt. The rover drove 32 meters on Sol 964, to a position that gave us a good view of the terrain ahead and outcrops of interest. Although we hadplanned a drive of up to 48 m towards "Logan’s Run" on Sol 963, the drive ended early after only 17 m due to the detection of a nearby hazard (a large rock). After cruising through Artist's Drive, Curiosity set her sights on the next pass, known as "Logan Pass." The short drive on sol 958 was a success, placing us at thetop of a small ridge, facing an outcrop dubbed "Daughter of the Sun". MSL drove about 65 meters on Sol 956, then took some nice images of the path ahead . With the last portion of the Telegraph Peak sample deliveredto SAM and analyzed by APXS, we are ready to keep driving. Our sol 952 drive went well, and we’re very close tocrossing over into a new "quad" of the map that was made before landing(meaning we will get a whole new bunch of target names to choose from!). MSL drove 18 meters on Sol 951, as planned, putting the rover in position to image the terrain ahead and plan a longerdrive on Sol 952. We are continuing our driving tour of Artist’s Drive, and weshould be reaching the 10k mark on Curiosity’s odometer in the sol 951 plan!The rover will start off the day with a targeted science block full of Mastcamobservations. Like most tourists who visit Artist’s Drive on Earth, Curiosity is busy taking lots of photos to document the valley walls of Artist’s Drive on Mars. As we started the planningday before sunrise, I was reminded of the first three months of the mission that we spent living on Mars time. The MAHLI operations team did a lot of good work preparing for Sol 946,so I expected that it would be an easy day for me as uplink lead. After receiving and analyzing the most recent"Garden City" data, the MSL team decided that more data are needed tobetter understand this interesting outcrop . Sols 942-943 Cap Rock "Kanosh"
Over the weekend, Curiosity drove further into Artist's Drive to investigate a rock named "Kanosh." Ryan and I are working ChemCam tactical operationsagain today, planning 3 sols to get MSL through the upcoming weekend. Interest in the dark and bright veins continues tobe high, so the Sol 937 plan is dominated by observations of thesefeatures. Last Friday weplanned some additional contact science at "Garden City." While many of us in the northern hemisphere are celebrating the first day of spring, Curiosity isbusy tending to her "Garden City." Over the weekend, Curiosity bumped closer to the target "Garden City" located in "Artist's Drive." Sols 924-927: Garden City Here We Come! Yesterday was a challenging day on Mars and Earth. The plan for today, as our SOWG (Science Operations WorkingGroup) chair put it, is to "get out of Dodge"! We will be driving to a locationwhere we can do "full MAHLI wheel imaging" in the coming sols. Good news! We’re allowed to use the arm again! The engineershave done all the diagnostics needed, and so today’s plan was dominated by armactivities for science. More diagnostic data are needed to fully understand the cause of the Sol 911 fault, so no arm activities are planned for this weekend. I'm MAHLI/MARDI uplink lead today, but there hasn't been much for me todo because of the restriction on arm activities following last week'sfault . Sols 905-907: Testing "Telegraph Peak"
The latest "bump"placed the rover in a good position for detailed study of the outcrop of interest, as we all hoped. Curiosity is insearch of the next drill target, and the main activity in today’s plan is to"bump" closer to a rock outcrop for contact science. Sols 899-902: Long weekend, long plan! Today we planned 4 sols to take the rover through President’sday weekend. The planning daykicked off to a great start, with the SOWG Chair (Aileen Yingst) reminding usthat we do have the coolest job in the world. The three sol planwill keep Curiosity very busy this weekend. MSL's batteries are almost fullycharged, so the Sol 890 plan includes another CheMin measurement of the"Mojave2" drill sample. The Sol 888 data show that the rover's batteries are recharging, and we received more data than expected. The Sol 887 data received this morning show that asample portion was successfully delivered to SAM, and the un-sieved part of the sample was dumped onto the ground as planned (the pile is justabove center in this image ). I'm SOWG Chair today, so I called in to enough of the operations planning teleconferences on Saturday to ensure that I was familiar with the goals for Sol 887. After successfullydrilling the target "Mojave2" on Sol 882, the next step is to deliver thesample to CheMin for analysis. On Sol 882 Curiositycompleted another full drill hole on Mars. The mini-drill activities planned for Sol 881 went well, so we are "go" to drill and acquire a new sample on Sol 882! I helped plan the Sol 881 MAHLI images, so was particularly happy to see them this morning. Well, we’re certainly hitting the ground running after ourflight software upgrade! Today we received some very nice MAHLI images of thetarget "Mojave2" that the rover brushed on sol 880. The flight softwaretransition is going well, and Curiosity is doing a test run of the newversion. by Ken Herkenhoff There won't be any MSL science planned this weekbecause the rover's software is being upgraded. Today’s plan for sols 871 and 872 is our last chance to getsome science done before we begin a week of no activity while the engineeringteam upgrades the rover software. This morning the MSLoperations team realized that the results of the MAHLI activitiesplanned for Sol 870 will not be received until Saturday. The "mini-drill" test on the Mojave rock target completed successfully, but MAHLI images taken after the test showed that the rotary-percussive drilling fractured the rock. Over the weekend, Curiosity did a short drive to get into position to drill at "Mojave." Sols 864-866: Hello Again, Pink Cliffs! The drive toward "Pink Cliffs" went according to plan, so inthe Sol 864 plan we will be doing a very short drive (called a "bump") towardour drilling target: "Mojave" (shown above). Sols 862-863: Goodbye Whale Rock! It’s time to hit the road again! In the Sol 862-863 plan, weare wrapping things up at "Whale Rock" and then driving about 85 m toward "PinkCliffs", where we hope to drill sometime soon. Sols 860-861: Happy New (Earth) Year! Happy New (Earth) Year! After the long holiday plans, the Curiosity team is back toplanning two days at a time.